This post is sponsored by Timeless Settings. Happy President's Day everyone! I've got a fun giveaway for you today from one of my fabulous sponsors, Timeless Settings! Timeless Settings is a fun online shop that is the perfect place to find unique home decor items at reasonable prices. They have a great selection of fun accents for your home and garden that are sure to appeal to you, my lovely readers! 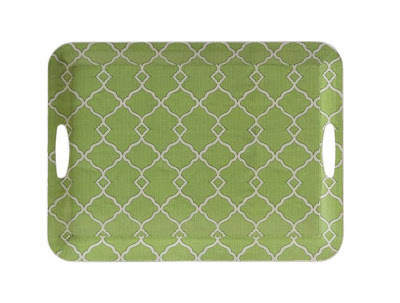 This pretty green trellis-pattern tray is a fun way to brighten up your kitchen! Ooh la la! I adore this french script table runner. What a pretty addition to any dining table! If you love vintage as much as I do, you'll appreciate this chicken wire milk bottle caddy...complete with the bottles. I also have a bit of an infatuation with mercury glass...so I love the selection of votive holders. 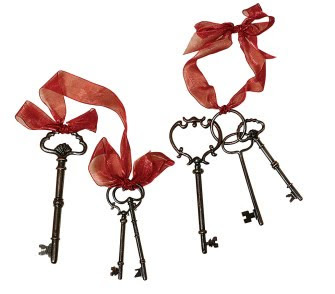 Or these pretty skeleton keys...what a lovely accent these would make! Donna from Timeless Settings has generously offered to give one reader of The Shabby Nest a $50 gift certificate to use in her shop. And with such reasonable prices, $50 will get you a long way toward beautifying your home! Hop over and check out Donna's shop, then leave me a comment telling me one or two of your favorite items. That's it. The giveaway will be open until Friday at 11:59 pm MST. This post was sponsored by Timeless Settings. The opinions expressed are 100% mine. I am loving the wire basket with bottles, and at only $9, what a deal!!! Oh, those scalloped buckets!! What a great site! that tray is so fun...and that runner is great too! if you get them: show us where you put them! LOVE the wire caddies with glass bottles, all of them. I'm also in love with the skeleton keys AND the garden stakes. Love the square wire basket with bottles & the french linen table runner. Thanks for the giveaway! How nice. Love the set of wood planter boxes! I love the mirrored trays!! 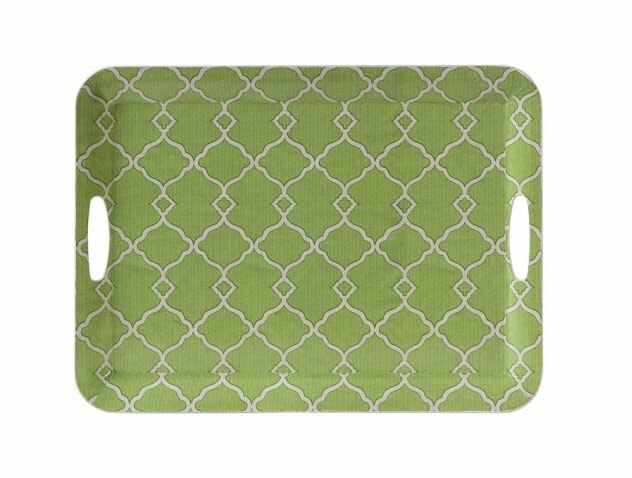 I love the french feedsack tray, and I have been wanting a tray! ooo so many pretty things! i love the skeleton keys and i also love the bird in the cage prints! I love the cottage style wooden tray and the salt and pepper birds. Those are ADORABLE! This shop is screaming my name! I love everything but I especially love the antique style bud vases and the three wire baskets. I also like the chicken wire milk bottle caddy and the metal file/magazine holder. I appreciate how affordable her prices are. She has such a lovely store! What a great website! I totally bookmarked it. The antique bloom vases were my favorite! Thanks for sharing! I love the wire baskets and the wooden boxes. Parisean mirror is SCREAMING my name! I love the beautiful floral tray set and the Frog Wine Bottle Holder just made me smile! Thanks! I like the springfield tea towel. So cute! LOVE the coffee and tea storage box!! I also love the vintage style paper towel holder. Thank you for sharing this store! I am in love with the store! I love the white farm animal canisters, coffee/tea storage box, and mail organizer. It's ALL so cute! Thanks!!! oh my i completely *heart* this new avenue of shopping for me! hmmm just two favorites!? ok i would have to say the enamel phot frame with stand, cluster a few of these but hang them on the back of a bookshelf, can u say *CA-UTE*!! and the read metal tray i would totally use this one as my catch all on my coffee table! i'm in luv! What a great site! Everything is so beautiful! My favorite is the scalloped tin buckets - pretty storage is always nice! Love that French script table runner! I love the bird salt and pepper shakers. They are adorable! Pottery barn has some that are kind of similar, but they aren't nearly as affordable! Oh, I love them all! But the wooden box most. I am obsessing over those skeleton keys!! Hope I win!! Kay so ya know how you see a picture, and you get all excited/squealy because you can see something bigger and fun to do with it??? That's me right now. I love that first caddy! Swoon. I see me out on the patio, first barbeque of the season. . . sigh. But those runners definitely do fit my house too. . .
great stuff! im lovin those bird topiaries and the springfield tea towel. im so ready for spring! LOVE that weathered tray you posted! And Bee magnet set for $7?? WOW! Great giveaway! Bookmarking her site not. Love it all. The three tier tray and antique keys are lovely. Thanks for the chance to win. I adore the three wire baskets! I LOVE the trio of scalloped tin buckets or that blossom vase...and the list goes on! I love this little shop! I really like the wire baskets and the milk bottles. 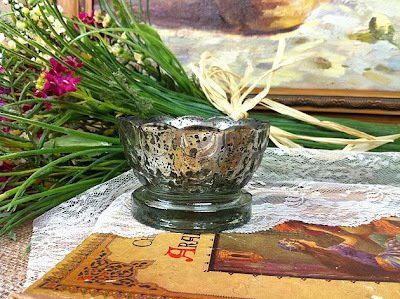 The mercury glass votives are beautiful as well! I'm her newest follwer and I checked out her store. Such great prices :) I love the Cottage Wall Clock! I posted about this giveaway on FB! Great shop...I love the tray!!! Oh my gosh...love the wire basket and milk bottles...the planters and such in her garden section are wonderful too!! love the mail organizer and wire baskets! lovely shop, thanks! I love all the caddies on this site! Love, love, love the red iron tray! And the 3-tier tray!!! I love the glass bucket with the jeweled bee! I like the Paris postcard pillow and the white canister set. So many cute things to love. I think I would choose the French Script table runner! hard to pick... there are so many awesome finds here!! I really like the Melamine French Feedsack Tray but I LOVE all the birds, so cute!! Wow, there are so many pretty items, but one of my favorites is the green bird wall hook because it looks like something my grandmother would've loved. Thanks for offering a giveaway! It's pretty hard to choose just one favorite. I love the tin buckets and the wooden cottage tray. Really love the tri-bucket and cute little bird bottles! So many things! I love the Daily Chalkboard and the Wire Memo Boards. I love so many things! I love everything vintage--thanks for the introduction to some really fun things. I love so much, the parisan clocks, the storage boxes, wire baskets, How do you choose? I love the cottage chic bird set and the french linen table runner...thanks for such an awesome giveaway! Love Timeless Settings store...I subscribed to the mailing list. Love how reasonable everything is!! oh lordy. It took me 10 minutes to pick just one.. but I would have to say the chicken wire planters! Too cute. Loving this site! what an awesome site! i like the trio of tin buckets! What a great shop! I love the Cottage clock and most of the wire baskets too! That runner is great too. The trio of scalloped trim buckets is my fave--tho also like the milk bottles in the carrier. My kitchen is so tiny! I love the idea or displaying my silverware in the Vintage Style Wooden Cutlery Holder. It would free up cabinet space and look great on my counter! ...and the wire photo and card holder would be perfect for a project I have in mind! I love the mod tray! Great prices! My favorite is that French linen table runner. Very elegant! the coffee/sugar/tea box is so sososo cute! what a lovely shop! There were so many adorable things...I loved the milk bottles as well, and also the three tier tray is SO cute! I love the bird salt & pepper shakers and her terra cotta & turquoise pots! Oh all of her stuff is just wonderful! I would like one of each but because that is not possible I am especially in love with the Wire Caddy with Milk Bottles. This piece can be used and filled in so many ways! I hope I win! Thanks for such a great giveaway! i love that red tray!!! gorgeous! Love the wire bottle caddies and the mirror with the little bird on it! I love the keys and the platter tray - very nice! i love the picture frames! really like the wire basket and French table runner! I love the wooden key holder and the tri-bucket and pretty much everything else. What fun site! Love it! I love the tri-bucket and the antique style blossom vase. Thanks!! I love the pink jewelry holder with birds! So lovely! bird mirror and any of the bird hooks....i am doing my spare room centered around the PB sparrow bedding set......ty for a chance! I'd love to have the red iron tray. I love the chippy goodness. I like the Cottage Clock! I love the wire basket with the bottles, the french script runner, the antiqued mirrors and trio of tin buckets :) fingers crossed! I really like the Cottage Style Wooden Tray and the Wooden Key Holder. The prices really are reasonable. are my top three BUT the vase would be perfect for the orange wooden roses my husband gave me for vanetines day because I have no vase that works for them. I think the french linen table runner is so adorable! Thanks for sharing this website! Such cute stuff! I love the Jeweled Bird Picture Frame and the bird book ends! I love the glass bottles and wire basket! That would be so cute with flowers! Love so many things but the skeleton keys bring back memories of when we lived in a brick home built in the 1800s on a military base. All the doors had the keyhole but alas no keys were to be found. Wow- what great stuff and prices! I love the bird prints. The Fleur de Lis stapler is tooooo cute! I just love the antique style blossom vase! So cute! OH WOW! I am in love with it all! I love your pics, especially that wooden caddy and table runner. I also love the tree mug holder and the bird soap dish. Everything is so chic and vintage!! I love that wire basket! Thanks for the giveaway!! What an awesome giveaway! Just visited her site and wow - love everything! I think my favorite is that script table runner - would love that for my dining room table! So many great things! I love the cottage chic bird set, the blossom vases and the Three Wire basket set. Thanks for the great giveaway!! So many adorable things, but I really like the mail organizers! I like the Parisian Clock and several of the mercury glass pieces. I love the Antique Style Blossom Vase and Wooden Caddy snd pretty much every thing! I really like the metal mirrors with opening doors, and the brown parisian clock. Such cute things! shop is SO up my alley! So many great things - I love anything milk bottles, wire mail organizer & the tri bucket are my favs! I love the Vintage look ring holder...so fun! That tri-bucket is really cool. She has a lot of cool things, and really reasonable prices! I adore the round white frame with stand and all of the wire baskets. What a great site! I love the antique style blossom vase and the Bath plaque! I like the Trio of Scalloped Tin Buckets! I love the Trio of Oval Tin Buckets as we're currently building a deck. I can just imagine them filled up with herbs. What a fun site. I love the bottles in the basket, or the woooden tray. So many cute things! Love the birdcage & flower trays!! Love so many things...but, the red iron tray and pewter bird bottle stopper, would look great on my porch!! I did a post on my wishlist should I be so lucky to win...please enter me again. Thanks! I LOVE the wooden birds on the posts!!! I love the keys and the bottles in the wire basket. I really like the chicken wire bottle holder too, and the wooden tote. I love the strawberry table cloth and also the Parisian canister set. Lots of cool wire caddies, too. Great shop - thanks for sharing! Love the three tiered tray! I love the Antique Keys with Ribbon and what a great price! 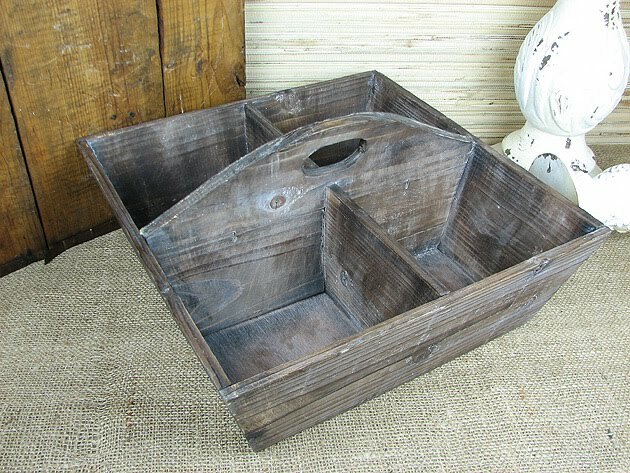 I particularly love the shabby chic metal tray three wooden planter boxes. I love to fill things with oddities! Well, I love it all, but I'd start with the blossom vase! 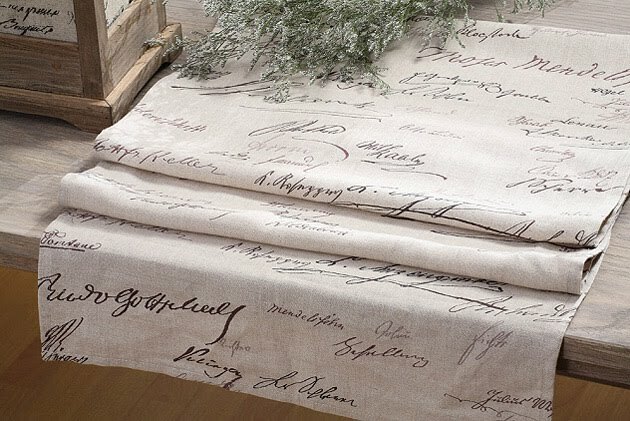 EEEEEK, I love the french script table runner...perfect! Like the Coffee and Tea Storage Box and the Tri Bucket is way cool! Thanks for entering me in the drawing! I love the Parisian mirror! I love the decapoged bunny tray! I love the Mercury Glass Jar with Lid!!! I love the set of 3 glass tea light holders and the wooden caddy! She has so many things to love but since I have spring fever I love her bird topiary and the three chicken wire pots. I love the parisian mirror and any of the glass bottles in wire baskets. And I'm going to have to have some of those keys! I love all of the mercury glass votives so it would hard to choose just one but I also liked the sunflower seed bird feeder. I could totally redo my living room with these prices! I'm loving the keys and the parisian mirror. I posted a facebook message about her shop and the give away! Definitely the chicken wire milk bottle caddy. Thanks to you both for the give away. I love the cute little bird feeders! I LOVE THE BLUE PARISIAN CLOCK & THE MILK BOTTLES + WIRE CONTAINER! I love the Bird Bookends and the Jewelry Tree With Birds! I am loving that French script runner, I'd definitely get that! I would also purchase the wire carrier! Very nice items! What a cute store! I love the cottage birds and the Eiffel Tower. They are beautiful pieces. I like the three tiered wire rack! I love the wire caddy with the bottles - a great way to corral my scrapbooking pens!! What an awesome giveaway! I love birds, so the bird bookends and mirror are my fave! Love the oval basket! It would be perfect for picking flowers come spring. I love the antique style blossom vase and the bird bookends, plus much more. What a fun site with great prices! Birds on a pedestal . . . how neat is that! These are my absolute favorites! I love the chubby birds - giggles! Sorry for so much but the shop is awesome! Thanks for sharing. I have come from Susan's blog BNOTP and Timeless settings to your blog. I would love to enter the giveaway but I live in the UK. I have contacted Timeless Settings to see how much the postage would be if I bought the French table runner.I also love the little crate with the bottles, I can never find such lovely items here in the UK!! What a great number of comments you receive, but then you have over 4000 followers of which I have now become one! Great blog, best wishes, Jackie in Surrey, UK. I love the French Linen Table runner and also the chicken wire planter. Of course I love everything!! I love the wire basket with bottles and the trio of tin birds. I shared on facebook too.. I'm in love with the celadon and orange pot and vase, and also the poppy tablecloth! Thanks for sharing the site!! I love the wooden key rack. And such great prices!! Oh so many things to love! I really like the wire basket with milk bottles! Wow what a great shop! 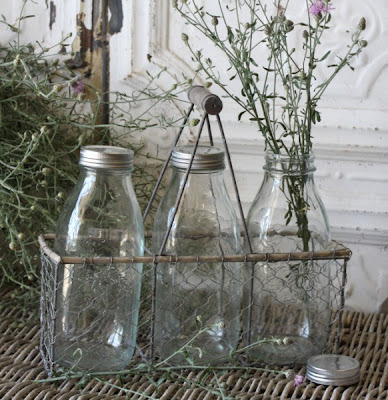 I love the wire baskets with milk bottles and the scalloped metal tin buckets! the keys the keys the keys! I love them! They would be fantastic accessories. Thank you so much for sharing! I love everything:)!! I have my eye on the 'Coffee and Tea Storage Box'... I hope I win! I love the shop! the bird cage prints and French feedsack tray are great. Would love a spending spree in her shop! Thanks for sharing. wow! that birdcage chandelier is amazing! that would be the perfect thing to hang in my kitchen window. I love the bird bookends and the wire basket with the milk bottles! Im so glad to have found her site! Thank you! I love the birdcage chandelier! Love the white three tier tray...all of the mercury glass and the birdcage chandelier. I could buy just about everything she has for sale! So much cute stuff! I especially love the chicken wire planters. 6 little birds for only $9! How fun!! Thanks for sharing this source and for the generous giveaway. What pretties! I adore the bird mirror & want the trio of scalloped tin buckets for my craft room. They would be so perfect there. i LOVE the wire basket and bottles!! i also love the table runner!!! I loved the french linen tale runner....especially loved that it was only $18!!!!!! I like the hanging glass hurricane & the 3-tiered tray for jewelry. Wow! What a fun give-away! I like the milk bottles and metal carrier. I also like the wooden box to put silverware in. Wow- Thanks for turning me on to such a fabulous store! I love the clocks, the wire baskets, oh, just about Everything! I love the wire rack and the adorable serving tray! i love the french script table runner... and would love to have any or all of the mercury glass items. so pretty! I really like the mercury glass and the glass botanical wall art. Gorgeous stuff!!! It was hard to pick just a couple favorites. I love the french postcard pillow, glass bottles with tray, and tri bucket. Oh my gosh! I love just about everything in her shop, but I really like the three scalloped tin buckets and the wooden cutlery holder! The bottles with chicken wire are adorable, but her website has soooo many great items. Love her glass bottles with crystal crown tops and her wooden planter baskets. Oooh - the french feedsack tray! I love the bird cage mirror hook and the green wire photo holder! Metal Mirror with Opening Doors & Wire Basket with Milk Bottles. I NEED these in my life! (http://www.timeless-settings.com/set-of-4-cast-iron-mirror-hooks.html) Probably for jewelry!